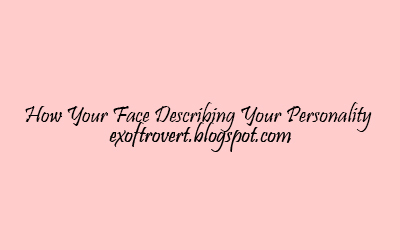 How Your Face Describing Your Personality - Have you ever look in the mirror and pay attention to your face shape? Alternatively, you never pay attention to your face shape to your friends? Did you know that from the face shape, you can read a person's character. It's fun! Activities read characters of this face shape is very popular in the country of China, in fact, turned out to be parts of the face, such as eyes, ears, and nose can also reflect the personality of a person. Well, you've certainly read you curious as to what the character of the face? Come, see the explanation. If you have a round face, you have a high emotional level. You are a person of taste and attention. The face is round also showed brilliance, like the practical, and dynamic. But round face not always found in obese people. People who have a face shape box are the type who tend to be aggressive, ambitious, and dominant. They have strong principles, so they are not easily influenced by others. People faced boxes also have analytical thinking and dependable. You who has an oval face is a hard worker. You trusted people to give a solution. You tend to have an athletic physical is creating a sense of excessive narcissistic, where it can ruin your relationship with others. Hmm, do not narcissistic yes, Readers, just to taste. There are two types of the triangular faces. Triangular face up and face down triangle. People who have a triangular face has a wide forehead to the top of which is smaller than the width of the jaw. They are delightful people for advice or solutions. They are also able to influence others. With a triangular face has a wide forehead downward larger than the width of the jaw. They have a generous character and love to learn. They are also the people who are creative and have a high sensitivity. Most people with triangular faces are the ones easy temperament and emotion. Aside from the face shape, you can also read a person's character by the shape of the forehead, eyebrows, eyes, nose, and lips, Readers. Let's see! Who has a wide forehead? Do not need to worry, Readers. You know not if forehead indicates a smart person and have more skill than others. People forehead width is the idealistic and have many ideas. You having a flat forehead are the ones who have logical thinking and pragmatic. You like to show the facts of the issues that are going on. You are a dreamer and has a strong ambition. Thin eyebrows tend to detail the minutiae. The lack of them is lack of confidence. People with this eyebrow shape is usually the person who is simple and humble. You got eyebrows with this shape are outgoing and sociable. You are a humorous person. Readers, if you have eyebrows that are both almost disconnected, you are a leader who firmly and wisely. Wow!